Historically, training is a key element of the progress and development of everyone. It helps us to improve skills in order to integrate into working life and into society at large as effortlessly as possible. As part of the recruitment of staff in the institutions of the European Union, Renouveau et Démocratie (R&D) has grasped the importance of this issue. The European civil service chooses its employees through selections and competitions. The Staff Regulations stipulate that “recruitment shall be directed to securing for the Institution services of officials of the highest standard of ability, efficiency and integrity,recruited on the widest possible geographical basis within the Union“. As a trade union in the European Commission, R&D supports such a system, whose procedures must be fully transparent and objective and ensure equal treatment and access among the candidates. It is not just a matter of selecting the best candidates: credibility and confidence in the EU project and in the European institutions also depend on exemplary recruitment procedures. Thus, since it was founded in 1992, R&D offers preparatory courses for selection tests to colleagues. The courses ensure quality training, and, especially, are accessible to all because they are free and cover all types and levels of tests. As solidarity is a core value of R&D, the courses are also accessible to persons outside the institutions depending on the availability of places. Thousands of colleagues have so been able to benefit from this training and enter the European civil service. Moreover, in order to improve and develop this major policy, R&D has created a space dedicated specifically to training http://formation.renouveau-democratie.eu/ . This tool, which is an interface between R&D and colleagues, aims to expand soon the offer of e-learning courses. Since 2010, the European Personnel Selection Office (EPSO) has launched a new recruitment procedure that focuses more on skills than knowledge. This manual is one of the teaching tools that follows this perspective. R&D hopes it will allow everyone to refine his/her methodology and develop his/her own strategy, firstly by making best use of his/her strengths, and also by controlling his/her weaknesses. R&D would like to thank the authors of this book, Anne Draime and Mirko Widenhorn, who have worked hard to present a tool that is functional and the most comprehensive as possible. 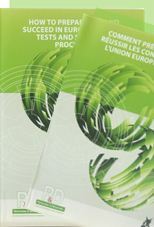 R&D hopes this guide will be useful and will help anyone wishing to enter the European public service to prepare themselves as well as possible and approach the competition tests with confidence.